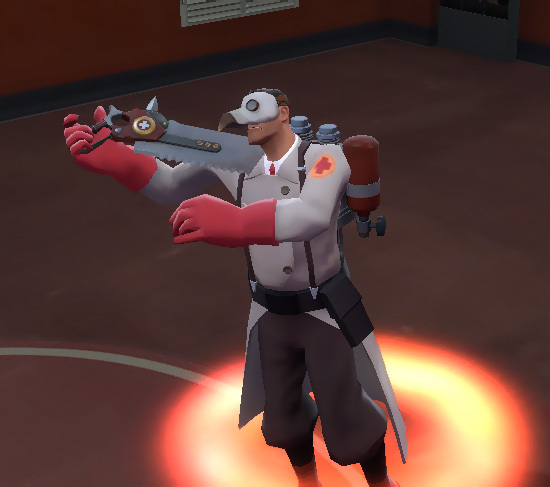 With the help of a friend, I have acquired a Blighted Beak for my medic in Team Fortress 2. I also happen to have a Name Tag, allowing me to name an item. It's modeled after the primitive respirators worn by plague doctors in the middle ages. What should I name this mask? The default name is "Blighted Beak". Surly there's a better name I could give it. Never mind that he's playing violin on his bone saw1. 1: Yes, I know that's actually the Amputator weapon. The "plagued peck"... the "wretched respirator"... the "bubonic bird"... the "Marf mask"... and as long as you're fiddling, maybe the "Nero nipper".